Plate 5 from the third set of Thomas and William Daniell's 'Oriental Scenery.' This monumental gateway, which shows the fish emblem of the Nawabs of Avadh on the spandrels, used to lead to the palace of Nawab Shuja' al-Daula in Lucknow, mostly built by him and his father Safdar Jang round an earlier fortification in the period 1752-65 . 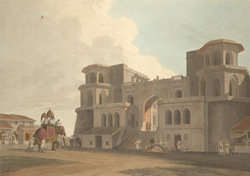 The ramp within the gateway was for allowing elephants' easy access to the inner courtyard. The gateway is built in a simple and solid architectural style, typical of the Late Mughal style of Lucknow at this period.